The US Department of Transportation (USDOT) has announced the two finalists for the third and final stage of the Solving for Safety Visualization Challenge, which was launched in June last year to find solutions that could reduce serious crashes on the USA’s road and rail systems. The Challenge, a national, multistage competition, was opened for individuals and teams to compete for a total prize fund of US$350,000, by developing innovative analytical visualization tools to gain insights or inform decisions to improve safety by reducing fatalities and serious injuries on the country’s road and rail network. The challenge was created to advance the use of safety data visualizations for answering analytical questions related to surface transportation system safety. Analytical visualization tools can cast new light on data to reveal insights into safety and prevention of serious crashes not seen through traditional analysis. The two finalists are teams from Ford Motor Co. and the University of Central Florida that were selected from five semi-finalists who were selected from a pool of 54 submissions and evaluated by USDOT technical experts. Simulation Tools that will assist in decision-making by visualizing data, mathematical, and statistical models to identify issues, determine correlations, and assign probabilities with a degree of accuracy. Stage I was a six-week stage in which applicants provided their ideas for the analytical visualization tool. Stage II was a four-week concept development stage in which the five semi-finalists presented a more detailed concept and prototype of their tool. USDOT has now invited the two finalists to advance to Stage III of the competition, which challenges contestants to develop their proofs of concept into full working analytical visualization tools. After demonstrating their tool, the two finalists will be awarded part of the final prize. 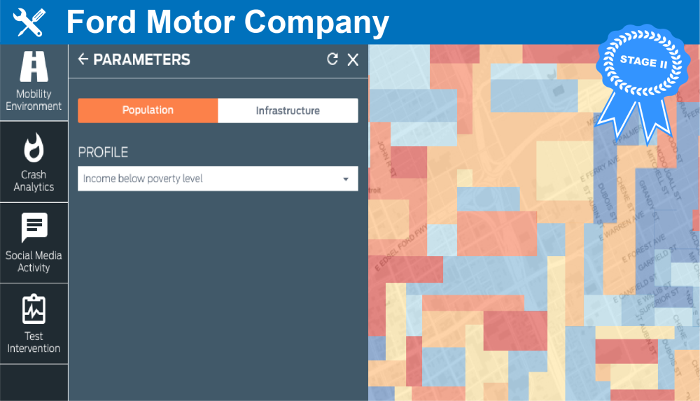 Based in Detroit, the Ford team will combine traditional crash data with connected vehicle and driver behavior, social media, and population data along with the Highway Safety Manual and Crash Modification Factors to help decision-makers uncover insights about safety opportunity areas, simulate potential interventions, and evaluate predicted impact. 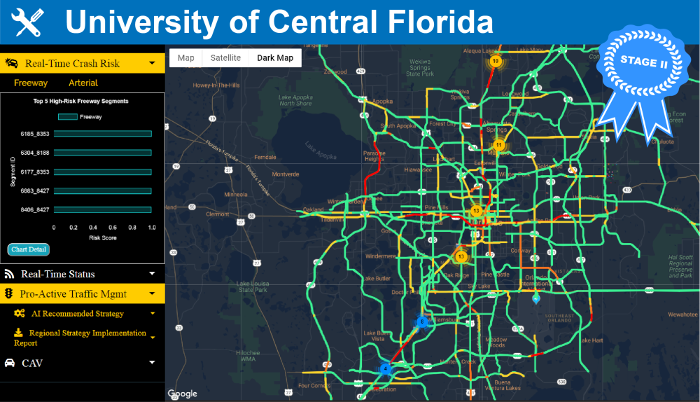 Based in Orlando, the University of Central Florida team will use artificial intelligence and integrate real-time and static data, providing predictive analytics and diagnosing real-time traffic safety conditions to suggest real-time interventions and long-term countermeasures to decision-makers and operators and inform the public of zip-code-level safety conditions.